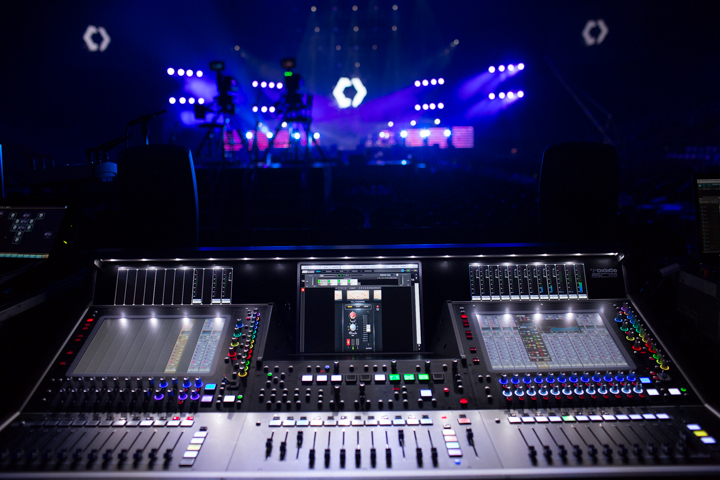 Learn how FOH engineer Stephen Bailey mixes live sound for music performances, panel discussions, video and more at the faith-based Catalyst conferences. 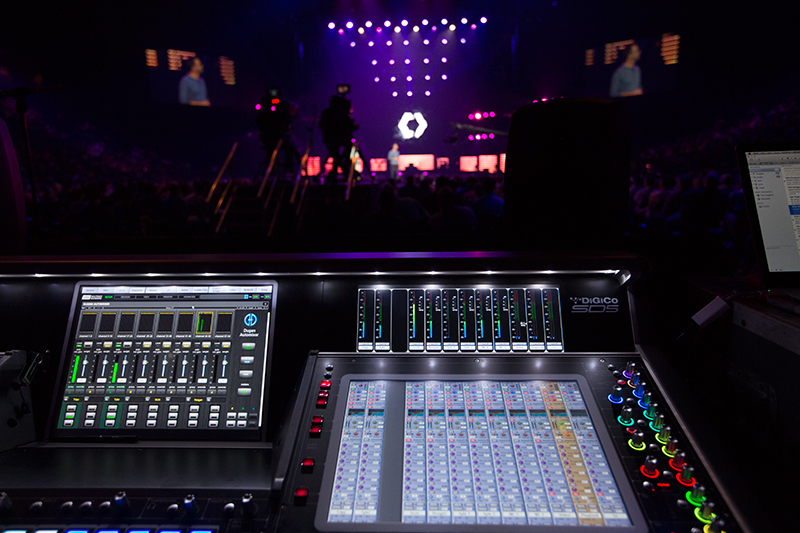 Over the past few years I’ve had the opportunity to mix FOH for a number of Catalyst conferences. Catalyst is an organization that puts on various events throughout the year, promoting healthy leadership with an emphasis on the church. 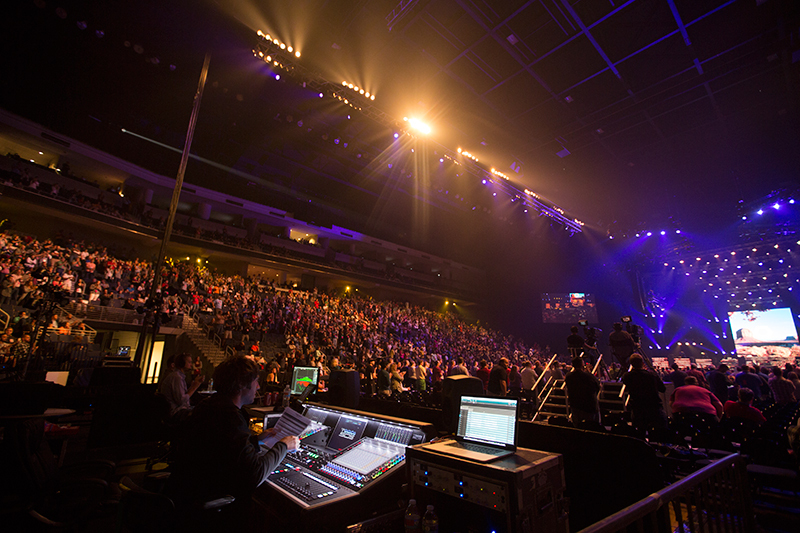 There are usually three conferences annually which are fairly large productions. The content for these events is as diverse as you can possibly get, including a standard pop/rock band doing top-40 songs, panel discussions, loads of video playback, and enough headset mics in front of the PA to really bring out that lovely, positive personality in any jaded audio guy. I love being a part of these conferences because they stretch me tremendously as an engineer. 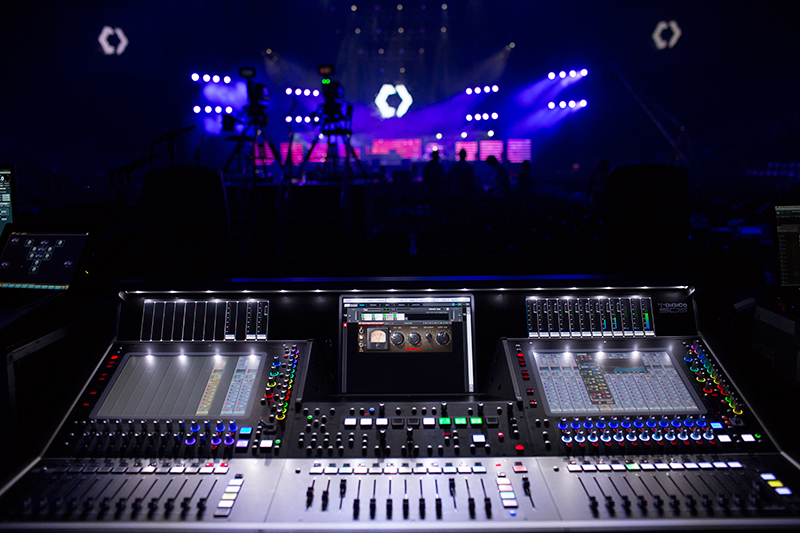 I’m forced to push both my gear and my brain to the limit and get very creative in order to make the event as pro sounding and seamless as possible. 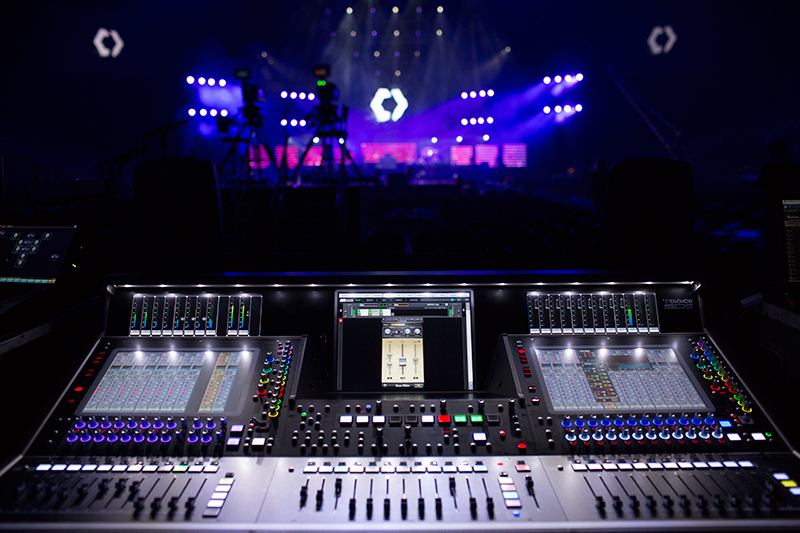 I’d like to share some of the software plugins and hardware tools I’ve been using to make these Catalyst events really happen in terms of sound. I want to demonstrate how effective they are across a diversity of inputs in a completely unstaged, real-world environment. 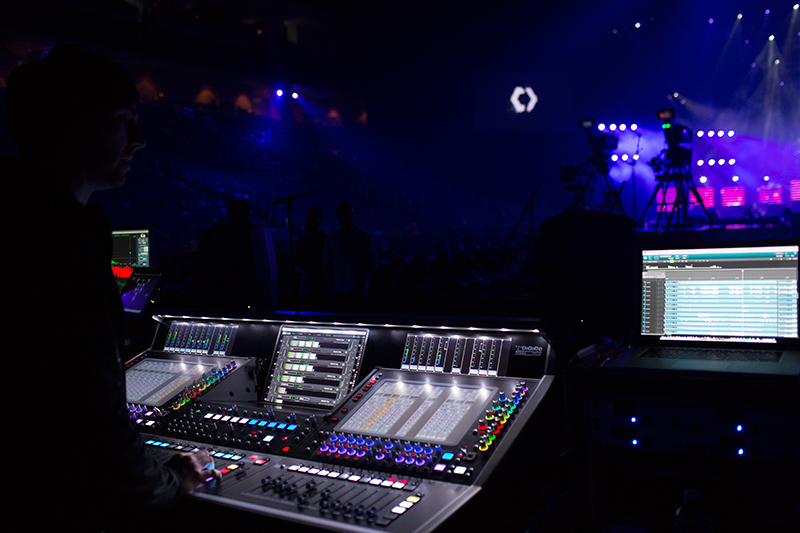 Except for the actual desk and one specific piece of outboard gear, every single tool and process I’ve been using across all of my inputs is powered by a 2RU black box known as the Waves SoundGrid Extreme Server. The MCs for the event are known as Tripp and Tyler. They are wearing DPA headset mics, and at any given moment they can be found hosting from absolutely anywhere in the room, including the main stage, stage B which is about 30 feet in front of the PA, or all the way in the back upper bowl of the arena. Typically they are standing directly next to each other, and since I'm running the Waves Dugan Automixer inside Waves MultiRack, I created a group in the Dugan Automixer that only included their two mics. The way the Dugan Automixer works is that it senses which input is receiving an actual active input, turns it up to unity, and ducks all other inputs in that group to minus (-) infinity. In other words, whoever is speaking is ON and everyone else is OFF until the first person is done speaking. If two people speak at the same time, it splits the inputs 50/50 so the level of audio coming out of the PA is the same as one person speaking at 100%. The real-world result of using the Dugan Automixer on Tripp and Tyler’s mics was crystal-clear audio with no phasing from their physical proximity, more rejection since only one mic was open at a time, and hence no feedback or ringing. 64 channels of the Dugan Automixer plugin can be incorporated into MultiRack. 64 channels of Dugan Automixer for the price of one license. 64! In my opinion and in the opinion of a lot of other engineers, this is the most powerful and most versatile audio tool ever made. It’s impossible for me to be happy with a live vocal anymore without a C6. You can’t fix dynamic things like proximity effect, plosives and sibilance with static EQ adjustments, unless you plan on living with a totally unnatural sounding vocal. The C6 does it all, while making the vocals sound very natural. If I had to choose one plugin to use for the rest of my life, it’s this one. As I’ve said, you need to be creative at this event in order to accomplish great end results. This is a perfect example of a tool that’s designed for leveling vocals, but instead I’ve used it on a talking head. The person speaking in this photo is Christine Cain – a brilliant and passionate speaker who champions social justice around the world. She prefers to use a handheld mic when speaking, and one of the issues that comes with a handheld mic in addition to her passion on stage are severe dynamics. I could have taken a couple of different approaches with channel compression, but no matter how perfect I got it, it still would have sounded crap. Why? As Taylor Swift puts it so eloquently, band-aids don’t fix bullet holes. I needed to solve about seven different issues with this input, and that’s why I dedicated a channel to this mic in MultiRack where I can use up to eight different tools if needed to sort it out. Using Vocal Rider on this input gave me the leverage to use 80% less compression and let the plugin actually ride the vocal for me, just as if I were riding the fader. This creates a much more natural sound – I’m talking night-and-day difference. Another plugin that works really well in this situation is MaxxVolume, which allows you to expand the low-level information and limit the loud information for a much more focused input without the dreadful sound of over-compression. In addition to all this, I was able to virtually eliminate the massive proximity effect and plosives from Christine’s handheld mic by using C6 and setting the attack time on the low (orange) band as fast as possible. I also used the high (yellow) band to catch any sibilance by adjusting the attack and release times. 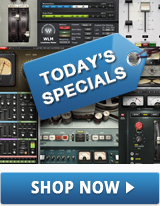 I’m usually either using the PuigChild or a CLA-76 for light compression on my vocals. 3-4 dB of gain reduction with these doesn’t sound like compression at all, it just sounds more ‘up front’ with some very nice character added. Waves’ modeled plugins enable me to mix into the music, where I can use compression creatively and not for the sole purpose of damage control. 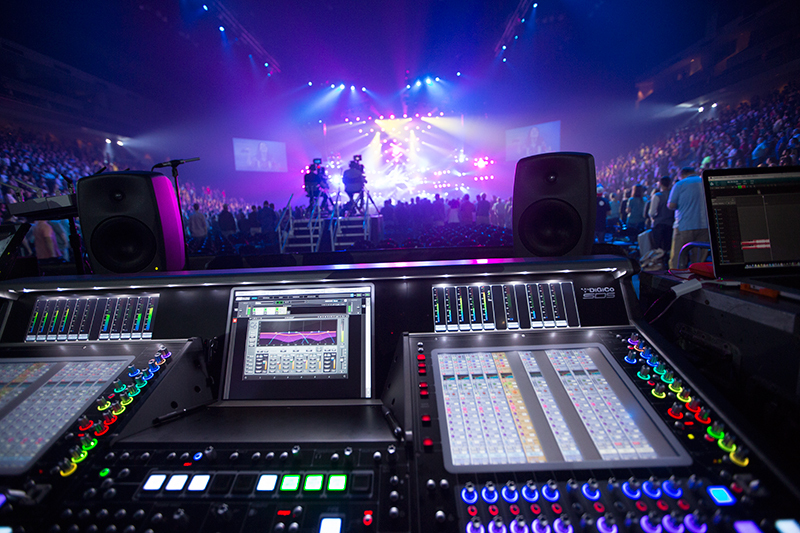 There are obviously major pros and cons that come with digital sound consoles. 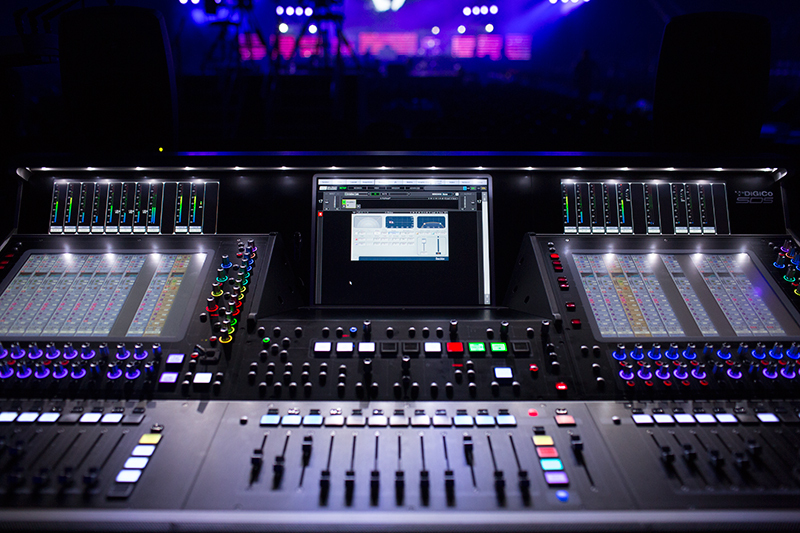 Technology enables manufacturers to integrate very high-quality preamps and A/D-D/A conversion in their desks. But since each channel is replicating audio using the same exact hardware and the same exact math, things can sometimes sound quite sterile. 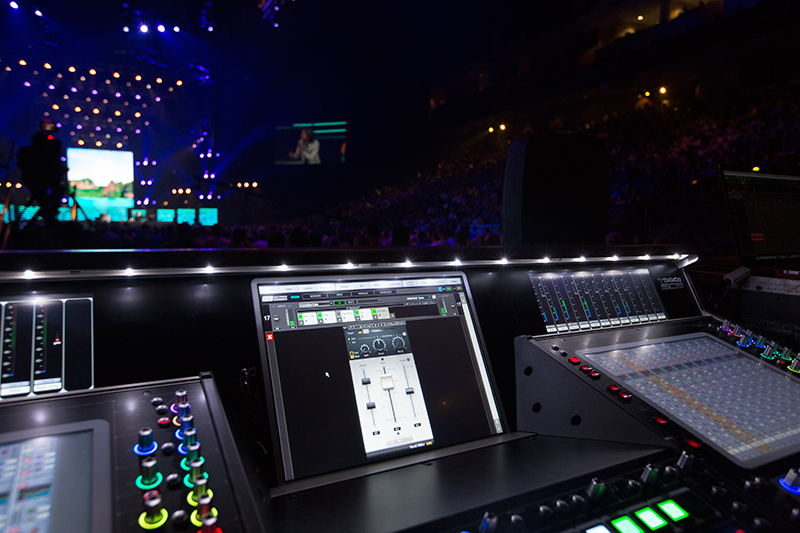 Waves have figured out a big reason why analog recording desks sound the way they do and have replicated it with a plugin called NLS, or Non-Linear Summer. 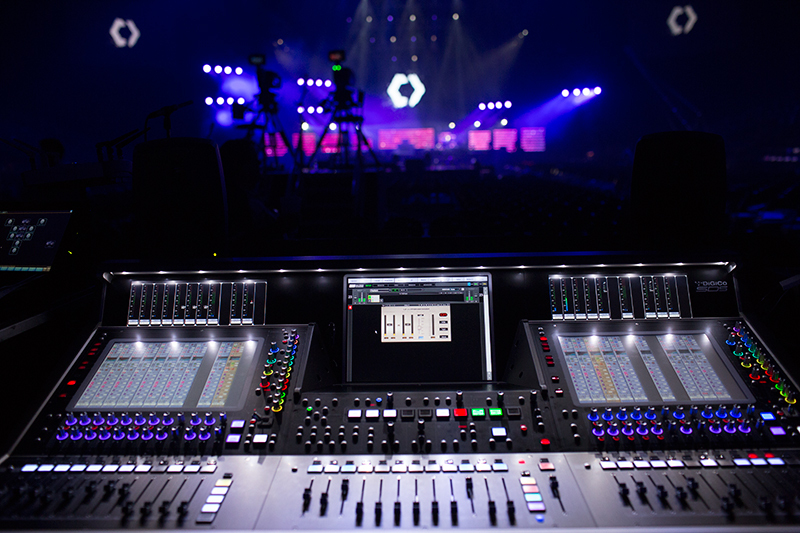 The basic premise of the NLS is that very subtle differences between individual channels added up over an entire console creates this saturation that increases warmth and depth while still retaining clarity. The high bit-depth bus architecture of most modern live consoles gives you a lot of sonic space to work with, and I use this plugin to capitalize on that space as much as possible. You know when a bass player starts playing up the neck and totally disappears from the mix for a few bars, then hits a low B and all of a sudden the sub array is sucking all the air out of your lungs? Bass Rider helps create a much more consistent mix foundation by keeping the bass present, yet in check at all times. I’m constantly focused on riding melody parts and important hooks of a song, but if I’m distracted because I’m unnecessarily riding the rhythm section the whole time, it’s going to be detrimental to the entire mix. With Bass Rider, I don’t need to worry about that. I love to hear bass guitar tone coming out of the PA and not just a ton of sub bass. However, we all know that a miked bass cab can be really hit or miss. What I find myself often doing is double patching the bass DI line to another channel and inserting the Waves GTR Amps modeled plugin on it. I make this ‘bass amp’ channel pretty dirty and gritty, usually starting with the RockBass preset or one of the OverBass presets, rolling out the bass and cranking the drive. When mixing, I start with my clean bass DI (which is what is going to the subs) as the foundation, and then I’ll add in as much or as little grit and tone as I want with this faux ‘amp’ channel I’ve created. If you try this yourself, keep in mind you need to have your bass DI and this bass ‘amp’ channel running through their own separate racks in MultiRack so you can use a latency group to time-align them. Otherwise these channels will be massively out of phase with each other. For one of Tripp and Tyler’s hosting moments we had a guest ‘villain.’ Our villain was just a normal guy wearing a mask off in some locker room somewhere on the other side of the arena, and speaking down a wired 58 mic. But we needed this guy to sound like a proper villain. The main issue was that he needed to remain intelligible to everyone in the audience, which is easier said than done in a room this size. Thanks to Doubler, we landed on the ’Shakey’ preset and had a perfectly intelligible, perfectly evil-sounding villain in less than 3 minutes. Most people use Doubler to thicken up vocals… I use it to create villains. I really don’t know what to say about this plugin other than you just need to demo it and try it yourself. I’m never using another reverb again. 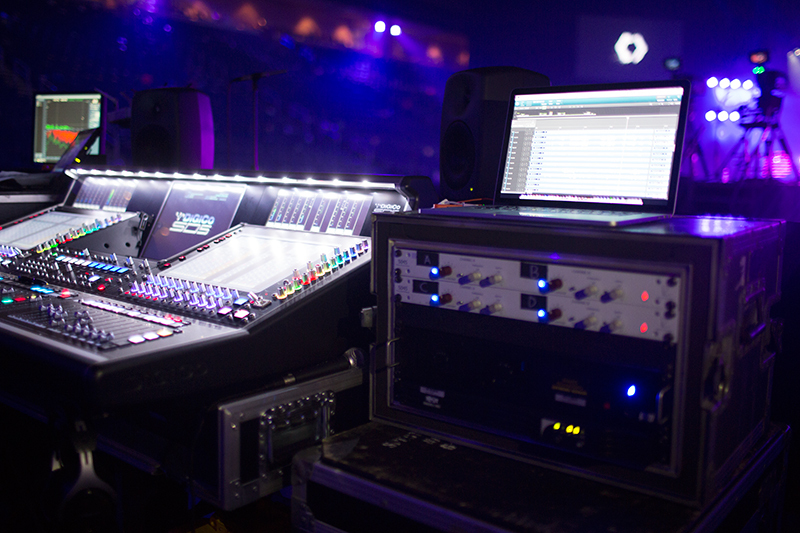 Every conference and gig I’ve ever done, the video playback content is always mixed and mastered by the same guy in the same room on the same speakers. NOT! Since this is absolutely never the case, I’m using L2 to limit the audio content coming from the video. I always set trims on my console inputs so that when I push the fader to zero, playback is very close to where it needs to be in the house. Once I’ve got these levels correct, I’ll then adjust L2 to catch and subdue any rogue video audio that could potentially come in hot when I’m sitting at unity on the channel. I’ve chosen L2 here because I think it’s the best-sounding limiter; however, MaxxVolume is really good at achieving the same results as well as offering a few more features over L2. On the right-hand side of the photo below you see Tracks Live running on my laptop. 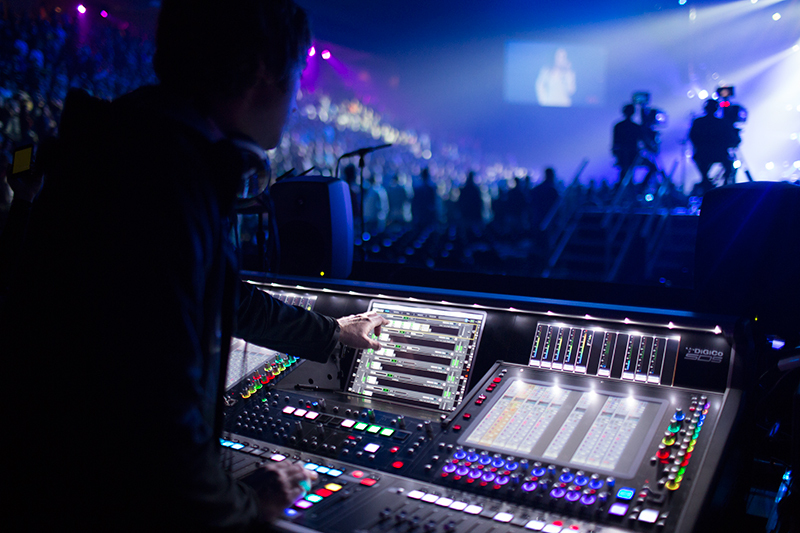 Tracks Live is a DAW that Waves developed specifically for multitrack recording of live gigs. It only does one thing, but it does it brilliantly. I always multitrack rehearsals as well as the gig itself, so I can go back and virtually sound check any inputs I think aren’t up to par. In addition to the multitrack recording, I also record a stereo mix of my master bus for archival purposes. 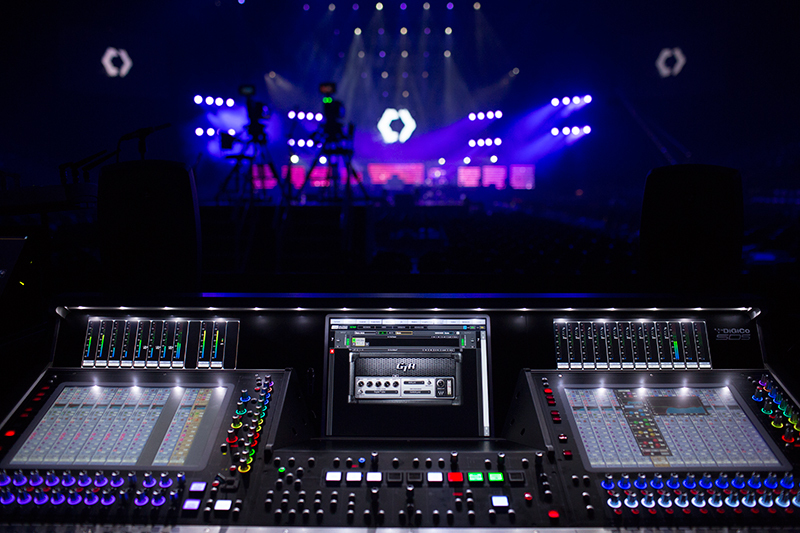 Having the capability to virtually soundcheck is a tremendous asset to any engineer, as well as being the best training tool available for live mixing. Most great things in the tech world seem to come in little black boxes. This little black box, the DiGiGrid MGB, takes two streams of coaxial MADI (DiGiGrid MGO does the same for optical MADI) and converts them to SoundGrid. Once audio is converted to SoundGrid you can do anything you want with it, including recording and playback from any DAW, plugin processing with MultiRack, or both, and tons more. You can plug in the bass player’s computer to this SoundGrid network with one network cable and have a fully redundant backup recording rig using any DAW that’s on his computer. It’s never going to get easier than this, my friends. 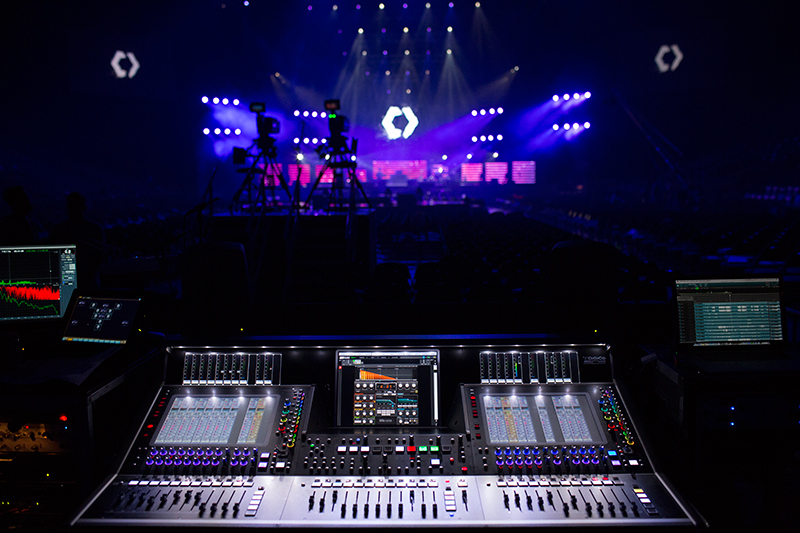 With a server, a small network switch, a little DiGiGrid MGB or MGO box and a laptop computer, I can run up to 512 world-class audio tools, as well as record and virtual-soundcheck 128 tracks of audio on any MADI-enabled console. All this from a small kit you can fit into your backpack. When equipped with the right tools and the understanding how and when to use them, it’s really remarkable what sort of experience you can create for an audience.